It was allready enough artist for the show at easter. So I hope for someone changing their mind about attending. Well, there will be other shows another day. This painting is just a little bit warmer in colours in reality. The Permanent Rose in the middle seem to have dissapared some. Ceruline blue, Paynes gray, Scarlet lake, Permanent rose, Lemon yellow, Neutral tint and white Gouache. I mixed Ceruline blue and red for the sky as I wanted a warmer feeling and not too bright colour. 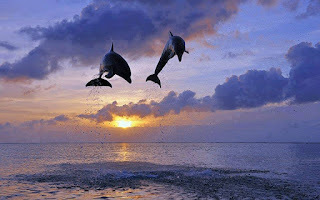 Referencephoto is from "Paint my photo"
Esta acuarela trasmite una hermosa sensación de libertad y alegría, hermosa!! Una bella acuarela con mucha vida y movimiento. Enhorabuena!!! Saludos. Catharina - what a marvelous painting of such a dynamic duo. Love it friend. Hope you have a wonderful week. Hugs! Happy you like it Debbie :) Thank you for your visit! 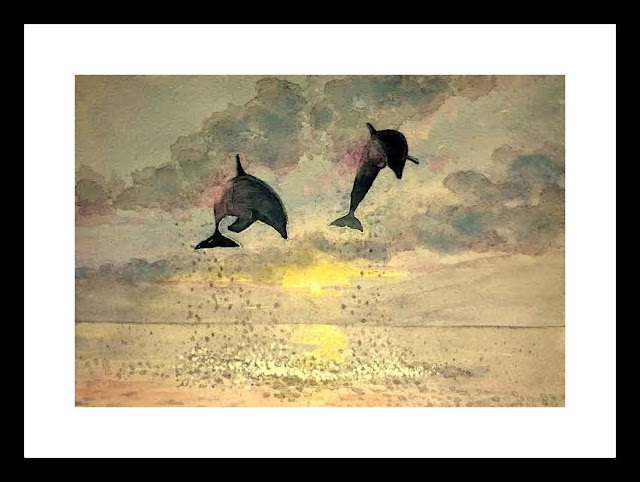 This painting is really gorgeous , what a lot of energy in these playful dolphins! Oh that makes me happy to hear Jane. :) Thank you for your visit. Ah there they are, the dolpins, I love them! Great subject! ;) Fun to paint them. Thank you for your visit and comment Judy! I had a fun time painting it Polly. Thank you! Dolphins - Tight focus allows the artist to connect with a niche buyer. In this case - aquatic scene lovers of the Florida coast or the Pacific northwest. Should a series of paintings develop from this painting ... gold is in your future. This is what the tea leaves tell me. Kudos. Oh I sure hope so Elizabeth! It sound great to me haha.